Teachers and state leaders gathered in Santa Clara County Saturday morning to voice support for Propositions 55 and 58, two California ballot measures that could directly impact students in the golden state. Those instructing youngsters believe in Proposition 55 and say that it will both incentive teachers to call the Bay Area home and restore cutbacks that slowed down progress years ago. "If our salaries and benefits aren't competitive, teachers leave to go elsewhere," said Jocelyn Merz, a San Jose Alum Rock Union School District teacher. Proposition 55 would raise the personal income tax for those making over $250,000 if it is approved in November. That money would then be used to fund education and healthcare programs. Anti-Proposition 55 voters say that too much of the money raised would end up in the state's general fund instead of feeding directly into California schools. Those in attendance at the California Teachers Association offices in the South Bay also applauded the proposed legislation of Proposition 58, which, if approved, would allow schools to implement bilingual education strategies. 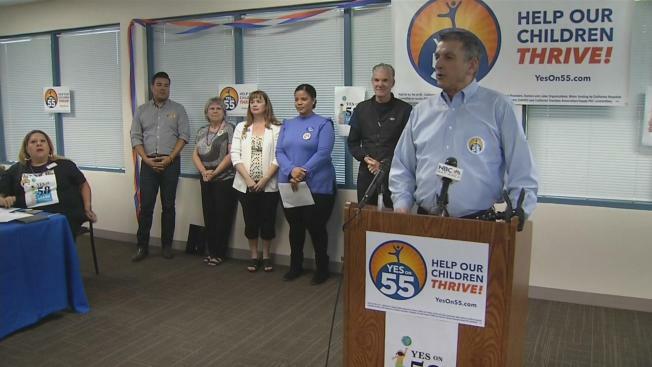 Supporters say implementing Proposition 58 will benefit the future employees and business leaders who will be tasked with making key decisions in a growing global economy structure. "We're competing directly with other world economies," said Sen. Ricardo Lara. "Why not give our students the tools to be able to close that deal in a language where they're doing business." Rob Unz, a former California gubernatorial candidate who also lead an effort to end bilingual education, is voicing opposition against the ballot measure. "20 years ago, something like 70 percent of all the young Latino immigrant children were being placed for years in these Spanish almost-only programs and were having a hard time learning English," he said.